September is National Emergency Preparedness Month here in the U.S. and nothing can make you feel more prepared for that, than this Power Supply and Jump Starter from Clore Automotive. I have had the honor and privilege of reviewing some amazing products from Clore Automotive over the past few years, and they have always impressed me with the craftsmanship and quality that they put into each product that they make. Check out my review of the JNC Air Jump Starter here, which I still have in my 2015 Nissan Xterra right this moment, just to give you an example of the love I have for the different product lines that they make. The Charge It! Portable 15000 mAh Power Pac delivers a sense of security, that you can use it when you need it to get through a situation, especially if you find yourself alone, and without help coming for some time, or none at all. Imagine it’s a cold day, you are the last person to leave work that night because of a project that kept you behind. You walk out the door, the door locks behind you, and you get to your vehicle, go to start it up, and it doesn’t want to start. It’s snowing, you hardly have any bars of service on your cell phone, what are you going to do? If you had this, or any of the other great products this company makes you might not do one thing, and that is panic. Don’t you love having peace of mind? Wouldn’t it be awesome to know that in your time of need that you could depend on a product to help you get home safe? Well, that is the feeling I get when I use some of the products from Clore Automotive. Let’s check out some of the features of it below. Multiple output for various devices. Just one of many cords that come with it for charging. Jumper Cables attached and ready to go! 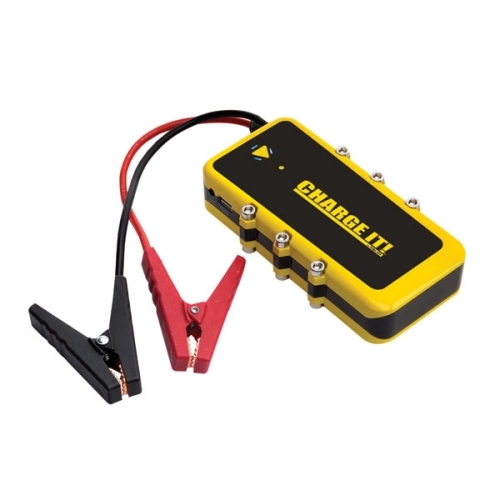 With it’s ability to jump start most 4 and 6 cylinder vehicles, and the fact that it is a 15000 mAh charger on top of that, this is a perfect accessory for anyone’s car, truck, SUV, small watercraft, or keep for emergencies in home kits, or emergency kits for your vehicle. This will be permanently in mine, and I will feel more secure and safe knowing that it is there to protect me and my wife, and to also be able to use it to assist others (pay it forward) in case there was a need to arise for that. Overall impression? With the ability to charge and power your phones, laptops, tablets, music devices, and more. Along with the ability to jump start most vehicle batteries, this device is perfect for those who like to be prepared like me, or would make a great gift idea for Christmas coming up (it’s closer than you think! ), for family members you want to keep safe. Are you prepared for an emergency or situation like this? Do you currently have something in your vehicle just in case? Who do you think you would get this for if you bought one? I should get one of these for my son’s truck. He is always needing a jump!!! They are awesome. I never drive anywhere without mine, especially road trips and vacations! This would be awesome for my daughter to keep in her car. She’s in college and you can never be too careful. We can never be to ready for an emergency that’s for sure and with winter on the way we need to think ahead !